Right angle drills (also known as close quarter drills) enable you to access really tight and small spaces compared to standard-sized, straight-line drills (Source). Variable speeds provide adjustable torque for different applications (Source). Plumbers, electricians, carpenters and other professional servicemen find them invaluable specialty power tools- great for pipe installations, threading electrical wire- any application that requires holding a drill for extended periods in awkward positions (Source). There are several options we like- but you will want to consider weight, RPM, whether it is cordless or corded, and price (Source). The Bosch right angle drill kit includes a pair of LED lights to illuminate dark crevices, it's also the best-rated cordless option. Unlike some other options- it includes a 5-position pivoting head that can adjust from 90-degrees to 180-degrees. The cordless Makita close-quarter drill has the most RPM at 1,800 RPM. The Bosch right angle drill is also the lightest option- weighing only 2.75 lbs. The lowest-cost option is the corded, Genesis close quarter drill, if price is your primary concern. This 55-degree angle drill offered by Neiko is affordable, well-balanced, and suitable for hard to reach places. Users love the variable speed option, but some do note that it’s heavy and bulky. The close quarter drill measures 12” x 2.9” x 4.9”, and it features a weight of 3.2 pounds, a 3/8” keyed chuck, an ergonomically designed trigger, a pistol grip for precise drilling and better RPM control. The right angle drill also has a variable speed that ranges from 0 – 1400 RMP, a drilling power of 500 W, and an on-body forward/ reverse switch. 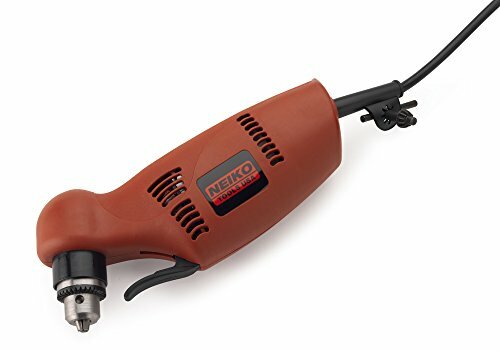 A customer mentions that the Neiko close quarter drill is perfect for DIY projects and that he drilled 5/32” holes into cement with no issues. He highly recommends it to anyone looking for a cheap drill. Another buyer comments that the drill is more powerful than he expected and that the chuck stays locked in place. A user adds that it’s perfect for wood crafting projects and that he drilled a 3/8 hole in hardwood in no time. He says that the right angle drill is very handy and that he has been using it for six months with no signs of malfunctioning However, some customers have complained that the gear stripped out very quickly and that it has a poor internal design. Some users also note that they had issues with the chuck, and they warn that the drill will last only for a couple of months. If you are looking for a top-notched drill for small places, you may take a look at this right angle drill kit offered by Dewalt. Users love the high-quality construction, but some do note that it’s manufactured in China. The Dewalt compact cordless drill measures 13” x 16” x 4.6”, and it features dual speed ranges 0-500 RMP and 0-1500 RMP for a wide variety of application, a multi-grip trigger for comfort, a 3/8 inch hex pocket, and a weight of 3.9 pounds. The package includes a 20-volt Lithium-ion battery, a 30-minute fast charger, a belt hook, and a plastic case for storage. A reviewer says that the Dewalt compact drill is powerful, well-made and that it takes about 15 minutes to recharge the battery. He highly recommends it as the best 20-volt cordless right angle drill available. Another buyer mentions that you can use the drill up to two hours without needing a recharge and that it’s one of his favorite tools. A purchaser comments that the torque is excellent and that this compact drill enables him to reach spots that would be impossible for an ordinary drill. He has been using it for more than four years, and he is very impressed with its construction and design. However, some customers have complained that they have problems with the chuck and that they expected more torque from the drill. This 3/8-inch compact close quarter drill offered by Genesis is well-designed, inexpensive, and innovative. Users love the price and the light construction, but some do note that the drill is noisy. 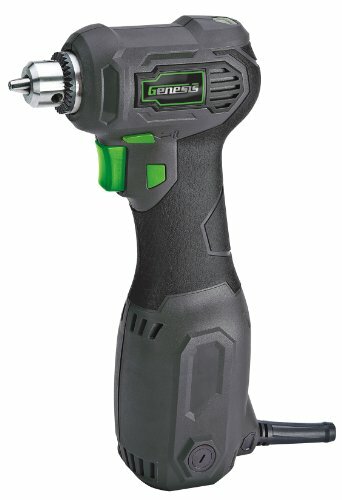 The Genesis right angle drill measures 11” x 5.5” x 3”, and it features a weight of 3.5 pounds, a 3/8-inch chuck, a compact head perfect for tight places, a powerful 3.5-amp motor, and a variable speed of 0-1600 RMP. The drill also has a lock-on button, a power-on indicator, a six feet cord, plastic handle, and two years limited warranty. In general, users have a favorable opinion regarding the Genesis close quarter drill, and they praise its design, reliability, and usefulness. A buyer comments that the drill has well-placed switches and that it’s very easy to control the speed. He adds that he is pleased with its performance and that he doesn’t have any complaints. Another customer mentions that the corded right angle drill is one of the best tools he has ever owned and that he is impressed with its functionality. A reviewer says that the handle is comfortable and that it allows him to access hard to reach areas with no issues. However, some customers have complained that the drill overheats and that the head is too large to reach some spots. Some users also note that the drill started malfunctioning quickly and that it’s not very well-balanced. If you need a reliable right angle drill, you might consider this compact cordless driver kit offered by Bosch. Users love the built-in battery meter and the variable speed feature, but some do note that the handle is not very comfortable if you have small hands. The Bosch right angle drill measures 9.75” x 12.5” x 4.25”, and it features an RPM of 1300, a max torque of 115 inch-pounds, a 5-position pivoting head that swivels from 90 degrees to 180 degrees, and a weight of 2.75 pounds. The close quarter driver also has a 3/8-inch auto lock chuck, and the package includes a charger, a 12-volt battery, and a carrying case. A reviewer states that he has been using the Bosch 3/8-inch right angle drill for years and that it’s solidly built, well-balanced, and powerful. He adds that the head can reach into places where no other drill can access and that the battery last for hours. Another buyer mentions that this is the best right angle drill that he has ever used and that it’s flexible and handy. A purchaser comments that it’s easy to control the drill and that Bosch always makes high-quality products. However, some customers have complained that the battery doesn’t last very long and that it’s not as powerful as they expected. Some users also note that the drill failed after a couple of months. This cordless close quarter drill kit offered by Makita is easy to use, powerful, compact and innovative. Users love the comfortable handle and the size, but some do note that there is no battery included in the package. The Makita cordless drill measures 12” x 3” x 5”, and it features a weight of 3.3 pounds, a 4-pole motor, a maximum torque of 121 in.- lbs, a variable speed from 0 – 1800 RMP, and a 3/8-inch keyless chuck for quick installation and removal. The drill also has a compact 3-1/2 inch angle head height and an ergonomic design which makes it ideal for close quarter use. As a whole, reviewers have a favorable opinion regarding the Making angle drill kit, and they praise its design, powerfulness, and convenience. 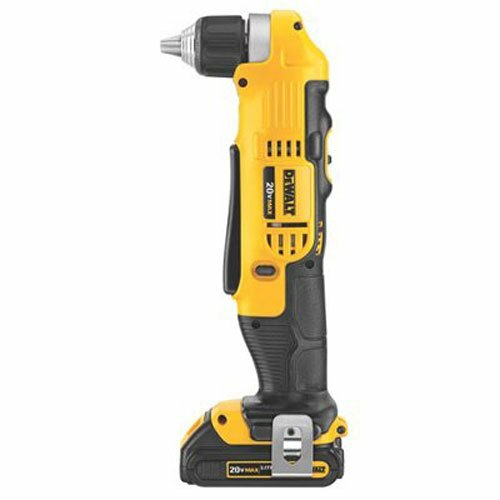 A buyer comments that the 18-volt drill is light and that you can use it all day without recharging it. He adds that he highly recommends it as the best cordless drill kit. Another customer mentions that the drill has enough torque to do the job perfectly and that there is no better tool for hard to reach places. A user states that the drill arrived quickly and that it’s more powerful and useful than he expected. However, a customer has complained that there is no low or high torque setting and that the drill started smoking after two minutes. Another user also notes that the drill lasted only a couple of months. The first right angle drill we examined is manufactured by Neiko. It is advertised as a close quarter option engineered to fit into those hard-to-reach & tight spaces- a 55° angle option that provides a power drill with a 3/8 inch keyed chuck. In addition, this is a reversible right angle drill, offering its operators the ability to quickly change directions with a reverse switch built into its body. It is also manufactured to be a variable speed right angle drill, adjusting from 0 to 1,400 RPM to accommodate different speed drilling in tight areas. While impressed by the low price, this Chinese-made option did receive some negative feedback from its use user base, with one buyer saying that after only a minimal use the internal gears were stripped, completely destroying it. Other buyers found it to be an effective right angle variable speed option that worked for really tight and sharp corner curtain installations. The second right angle drill we examine is manufactured by DeWalt- it is a Chinese made option with two different speed ranges, accommodating 0 to 1,500 RPM. Particularly lightweight a 3.9 pounds, this is an especially compact right angle drill that has a multi-grip trigger enabling operators to access tight spaces and get the job done. Specifically, DeWalt advertises it for users who are doing extended work in really tight areas like inside shelving areas, crawl spaces, beneath decks- particularly useful for carpenters, woodworkers and home remodelers. One buyer purchased it to drill through ceramic tile- first scoring it with a diamond tipped cutter and then employing a custom drill bit designed for tile. 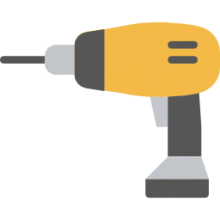 A professional home remodeler who does all of his own plumbing, electrical and rehab at work says that there's a battery-powered right angle drill takes under 15 minutes to get a full charge. He tells us that should you need to drill joists in your home, you might want to purchase a corded close quarter drill as opposed to one that runs on batteries. In general, reviewers were pleased with how little it weighs in conjunction with the robust power supplied from the lithium battery pack- a variable speed and compact option that stands up to long-term use. One criticism, albeit a mild one, is that it at its highest speed setting there is a little bit of a wobble. On a full charge, one reviewer reported to us that he got just under two hours of extended use without having to recharge- perfect for driving long screws into wall board and other surfaces. Another buyer told us that he eventually decide to purchase one of these dedicated right angle drills as opposed to outfitting his regular-styled drill with a right angle adapter- saying that this is a much easier means of getting the job done than the awkward configuration of an adaption kit. The third close quarters we examined is manufactured by Genesis- it includes a 3.5 amp motor and a variable speed that ranges from 0 to 1,600. One reviewer who was reinforcing his pool deck told us that this was a great option for strengthening it with supporting screws- saying it had enough torque and compact a build to powerfully reach into dark crevices. The reviewer who was initially hesitant told us that it has been an inexpensive option that has withstood extended use in small spaces as an alternative to employing bulky electric screwdrivers. 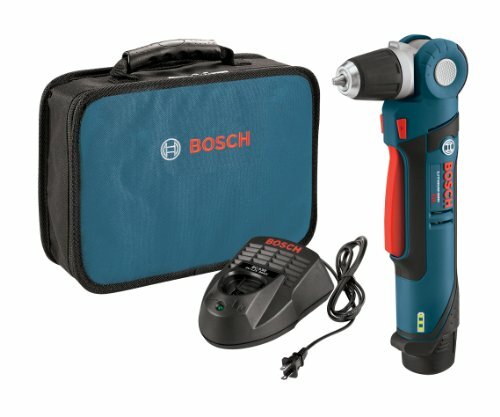 The fourth option we examined is the Bosch right angle drill kit- it has a 12 V motor that came provide up to 1,300 RPM with 115 in-lbs of max torque. The articulating head can pivot from 90° to 180°, making it particularly adaptable to your needs. Another interesting feature is that it includes a pair of LED lights to help illuminate door at work areas. One reviewer told us that he has been pleasantly surprised by this tool, saying that for him at functions as a power drill and a power screwdriver-a versatile tool with some unique extras. An electrician who is overall satisfied with it did say it took some practice initially to ensure that he did not over torque the screws he was working on. Ergonomically, another home rehab professional told us that the grip isn't the best- that the handle is too round for his fingers to get a satisfactory grip on. One carpenter who is remodeling his own home, working on windows that included really tight horizontal and vertical spaces, says he was able to use this overhead while on a ladder. He also told us that the LED lights make it an effective flashlight in a pinch, especially if you are on a ladder with limited access to nearby tools. A plumber we interviewed told us that as an appliance repair man he is frequently tasked with accessing a really tight spots- this tool has been essential to him crawling behind refrigerators, under sinks and using it to detach and reset various HVAC components. Certainly it is a specialty tool, but buyers say that if you have need for it only occasionally, it makes sense to purchase one rather than attempt to use right angle adapters or punish yourself with other more manual methods of getting the job done. 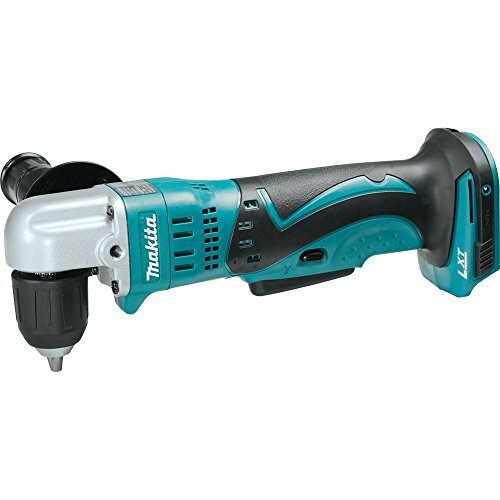 The last option we examined was the Makita cordless, battery-powered right angle drill kit. It delivers 121 in.lbs pounds of maximum torque with a variable speed range between 0 and 1800 utilizing a 3/8 inch keyless chuck. A 4 pound option, it's marketed as an essential specialty tool for people working on garage door installs, framing jobs, woodworking, plumbing and electrical work- anything that requires close quarter focus. It has received mixed feedback however, with a buyer criticizing its lack of a low or high torque setting, and some users saying that it broke down after several uses. Others say that it has worked well for them in tight spaces, but you have to be careful when you are tightening or loosening the chuck so that you don't pinch your fingers.